To create the cinematic world of IRIS a great many elements have to come together, play off each other and create a coherent environment of sights and sounds on the 9,600 sq. 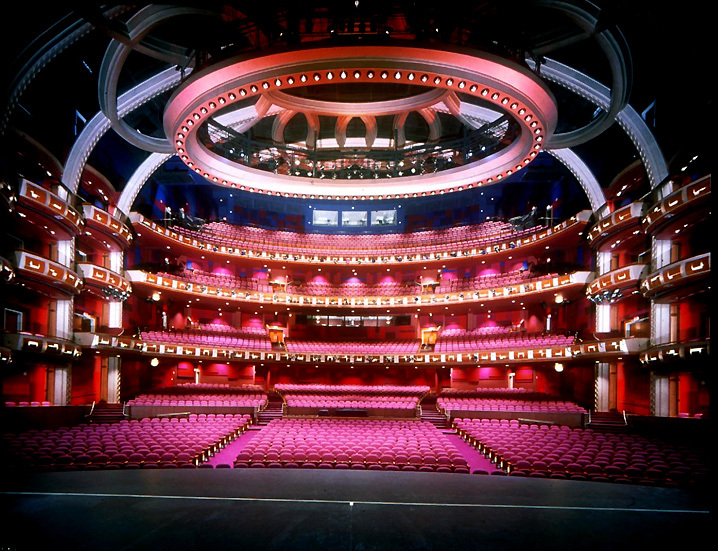 ft. stage of the majestic Dolby Theatre. The set design by Jean Rabasse provides the physical framework for the action and effects of the show. The sets’ infrastructure occupies a space that spans 122 ft. from the high grid to the bottom of the pit, and conceals a lift with a capacity of 20,000 lbs that rises and descends 34 ft. below the stage at a rate of one foot per second. His first decision was to avoid direct references to specific films, actors or directors, and to take a playful, universally accessible approach to creating a world of cinema. 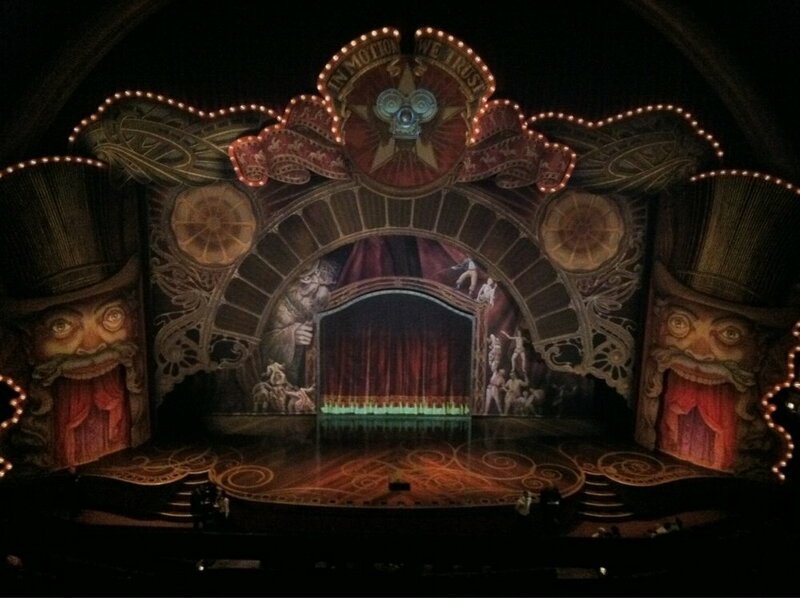 The set also had to provide a meeting place for acrobatics, circus arts, dance and projections. And it had to do so in such a way that cinema techniques and live performances could blend together. What Jean wanted to express was a love, not just of cinema, but of the whole process of film-making, from the technicians to the sound stage, to the nuts and bolts of the machinery and equipment The set suggests a fairground attraction inspired by Coney Island where movies were screened to an audience for the first time. Jean Rabasse’s concepts go beyond simple references to the paraphernalia of the film set. They complement performances by artists whose goal is to connect with the emotions of the audience. For Jean, the shadows on prehistoric cave walls were the beginnings of what would eventually be called cinema. The stories they told engaged the intelligence and the emotions as much as they appealed to the eyes. And so it is with IRIS. The show starts with shadows before bursting into color. The elements of positive and negative are essential components of film; they are also the names of the two giant figures flanking the stage. Above, the motto “In Motion We Trust” sums up not only the theme of moving pictures, but also the constant action of the show. The second act plunges into a rapid-fire succession of familiar film genres, and the set transforms just as rapidly to supply each number with a backdrop that supports the story elements through distinctive visual references such as costumes, hairstyles and the outlines of figures silhouetted in windows – as well as providing all the structures and anchor points needed for each act. 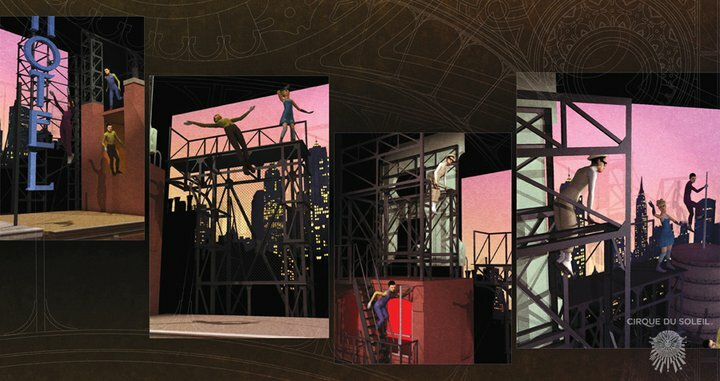 Some sequences, such as the Rooftops trampoline number vibrate with bright saturated colors and the sharp contrasts of shadows and silhouettes. However, the show’s overall color palette leans more toward earth tones – muted oranges and yellows. 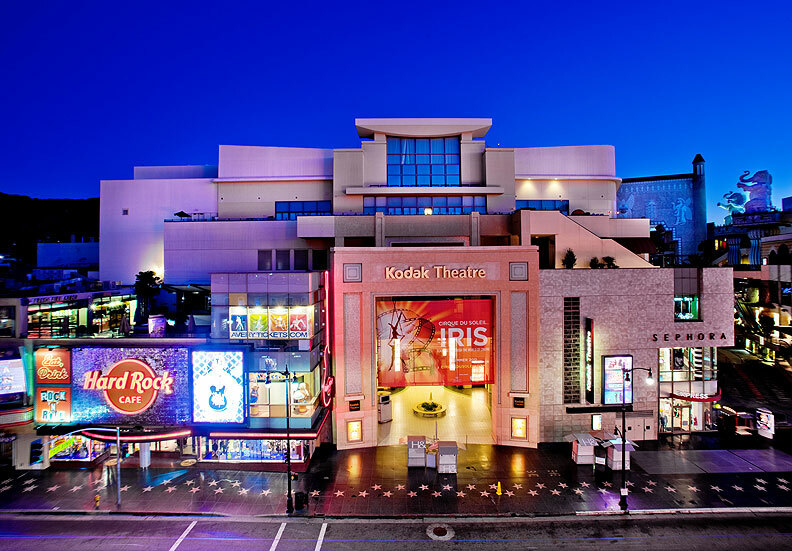 It has to be, to ensure that the vitally important projections are clearly visible from every seat in the vast Kodak Theatre. The result of extensive research and an exploration of the effects of scale, some of the IRIS props have taken on a life of their own. Resembling the contents of a cabinet of curiosities, they are variations on the themes of sound, optics, light and smoke. These little devices represent the beginnings of cinema and the mechanical inventions that made its development as an art form possible. Light sources and ingenious machines, as well as panels, ladders, beams and chairs, take on personality traits, transforming them into characters that give life to the artists who operate them. Visual delight abound in IRIS, not least among them are 360 unusual props, many automated and motion-controlled, all crafted specifically for this production. A quirky, vintage-looking camera dolly, for example, keeps with the unique interpretation of the world of early cinema that IRIS provides. But there's a catch: It is topped with a working camera that projects live video. The piece serves as an acrobatic apparatus, too: artists wheel the seat to spin on their heads, and they flip through its tripod base. 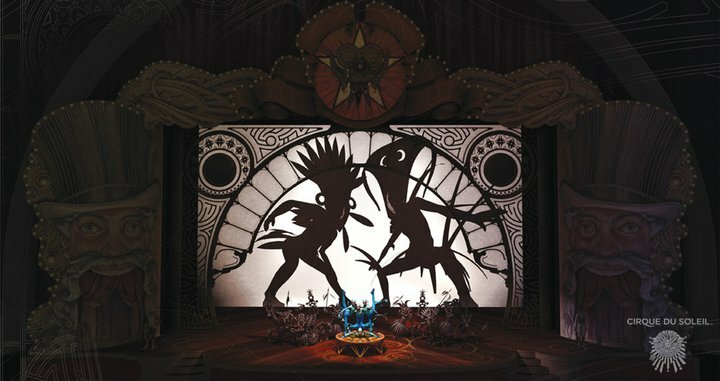 “Props used in Cirque du Soleil shows tend to be a little different,” says Jared Peter, head of props. The versatile camera dolly is one of three “baby machines” created for IRIS by Anne-Séguin Poirier, the company's Montreal-based props designer. Others include a roving spotlight and a trumpet-shaped gramophone speaker on tricycle wheels. Projection Designers Olivier Simola and Christophe Waksmann used a wide variety of unconventional materials in their concepts, including stretch plastic and micro-perforated tulle. 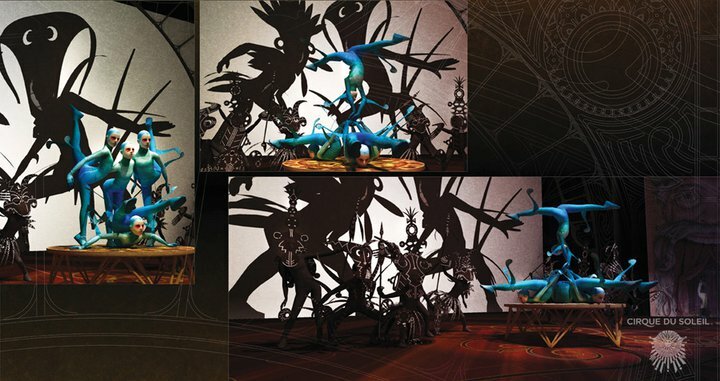 The stage, the set elements and, in one comic sequence, even the artists’ bodies and costumes are used as projection surfaces. The content of the projections is largely driven by movements of the live performers, and much of the time it is impossible to tell what is real and what is artificial. 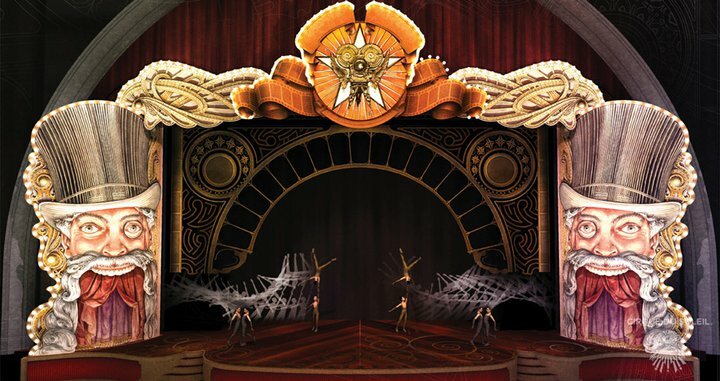 Early in the show, real-time projections of acrobats’ performances capture their movements as trails of still images – in very much the same way that frames of film create the persistence of vision effect that we see as motion pictures. The result is a living decomposition of movement that takes on a luminous life of its own as an ever-changing abstract kaleidoscope above the action. 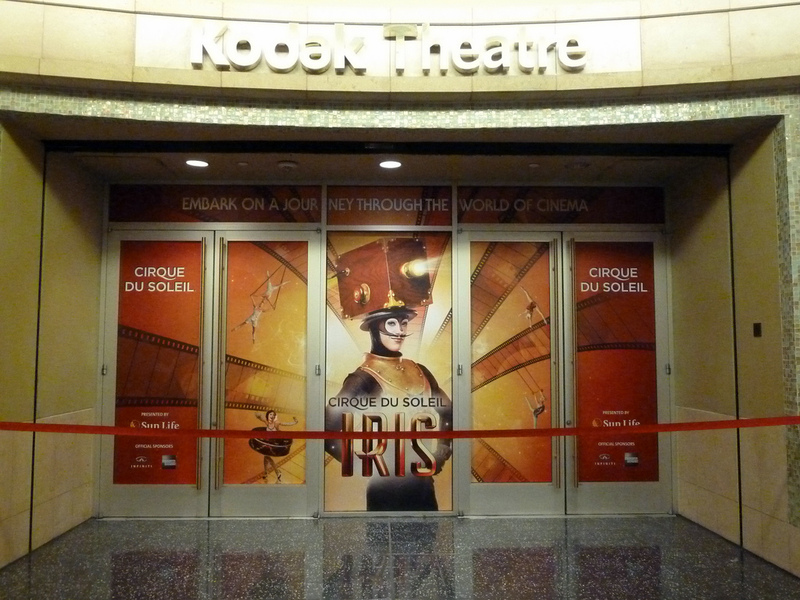 The IRIS projections are widely varied in both technical approach and content. Early in the show, a performer appears in a costume reminiscent of the praxinoscope, one of the first animation devices. Based on the stroboscopic effect, this costume illustrates the decomposition of movement. The circular structure of the skirt reveals – through slots as it rotates – two boxers in action. 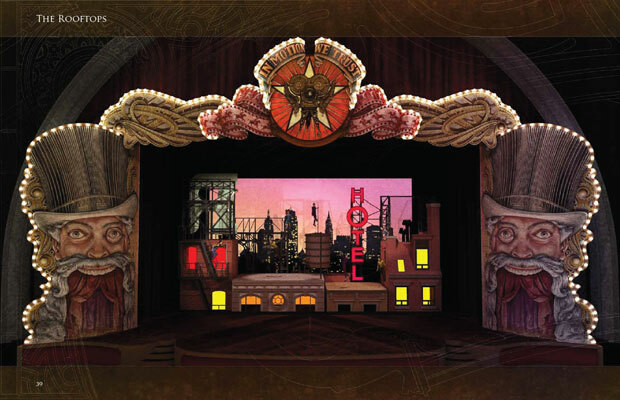 The virtual traveling scene seamlessly mixes live performance captured on camera with a succession of projected make-believe sets and props that take the artists from the streets of LA to outer space. And the Pursuit Race sequence recreates the menacing atmosphere of a classic 1940s Hollywood gangster flick as a set-up for the Rooftops number that is the closest the show comes to presenting an actual film to the IRIS audience. To achieve all this, and more, Olivier and Christophe used eight large 15,000-lumen video projectors for the main projections, six for the rear projections and four installed high above the stage to throw images onto set elements on either side of the stage. The team comprises of six full-time staff, four on-call staff and two artists. Each evening, they film live footage, process the images at light speed and project shadows. Tom, Head of Projections, explains what’s special about IRIS. 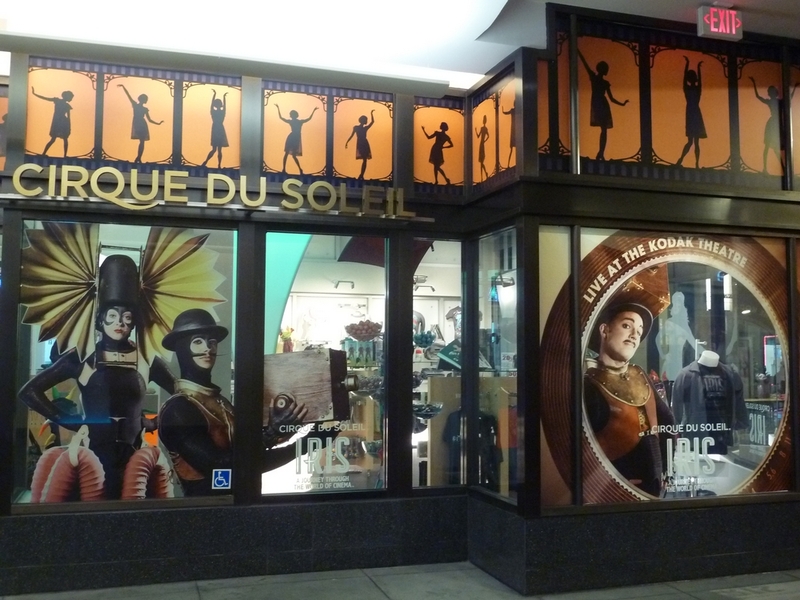 “Other Cirque shows, such as LOVE, Mystère or KÀ, mainly project pre-recorded images. 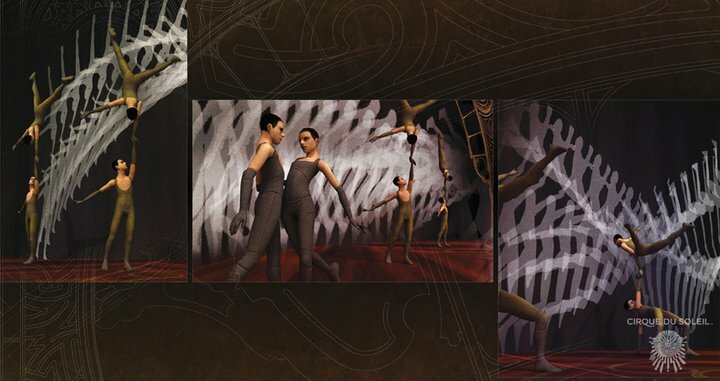 On IRIS, in addition to a few pre-recorded passages and real-time taping, we use infrared technology and projection mapping, which allow us to present the audience a full immersive experience!” The result — for the deconstructed images that enhance the hand-to-hand act or the kaleidoscopic effect that highlights the contortionists’ performance — is stunning. In addition to accompanying some acts, projections are also used to provide the set with volume and relief. Incredible, spectacular, never-before-seen — all terms that apply to both the show and the work of this dedicated team.